Fishing in Cawsand - Life in Cawsand today is largely governed by two seasons, the tourist season and the season spent recovering from it and preparing for the next. Nineteenth century Cawsand was governed by a set pattern of seasons related to the fishing. This affected not only the fishermen as all manner of folk would be eagerly pressed into service with the onset of the mackerel or pilchard season. The earlier part of the year was the Crabbing season. Fishermen would visit the woods to cut hazel and withies to make or mend their pots then set out in their small boats to their chosen grounds to drop the pots. In early April the excitement built up as the first shoals or mackerel were expected. Then it was that the Carpenters, Masons, Tailors and Shoemakers would await the cry from the huer on the cliff. The mackerel are up. At this they would leave their trades and rush to join the fourteen seine boats and the fourteen volyers that followed the seine boats in pursuit of the shoals. Meanwhile the womane would make their more leisurely way to the quays with their gurries or hand barrows. It was their job to collect the fish that their menfolk landed and to bargain with the jowters who bought the fish. Each boat had its own huer on the cliff. The huers job after announcing the sighting of the shoal was to guide his own boat to the fish signalling East or West by removing his coat and waving it from side to side and, when the boat was on top of the shoal, by placing his coat on his telescope and holding it aloft. Great rivalry between the boats sometimes led to angry words, or even sea battles and when smoke over Downderry signalled a shoal along the coast an existing race would ensue. Harvest time ashore coincided with the Pilchard season at sea or, a it was said 'Corn up in shock. Fish into rock'. 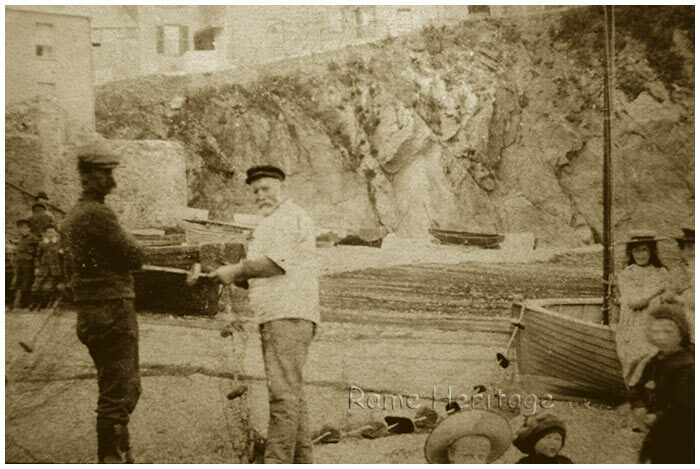 Here again all manner of tradesmen joined the boats and it was recorded that the last major haul of pilchard seiners was from Looe in 1866 and the master seiner was a tailor. Now the womens task was packing the pilchards in bulks in the Cellars, laid out and salted. After 28 days they would be taken out, washed and packed in hogsheads and pressed about 10 days. Once pressed the hogheads each weighing four and a quarter hundred weight would be sold to the fish merchants for export, mainly to Italy and other Mediterranean counties. Other pilchards were kept for home consumption. Each family would stock up taking up to 2000 pilchards for the Winter. The jowters to would purchase some to sell them around in the country districts. October came and with it the hake, caught with the pilchard nets but some also on hook and line. With November came the herring season and the boats would sail up the coast to Torbay then back around Bigbury Bay and Plymouth although a few boats continued to fish for pilchards from Looe throughout the Winter. Then as Winter Storms abated, came the crabbing season and the pattern began all over again.